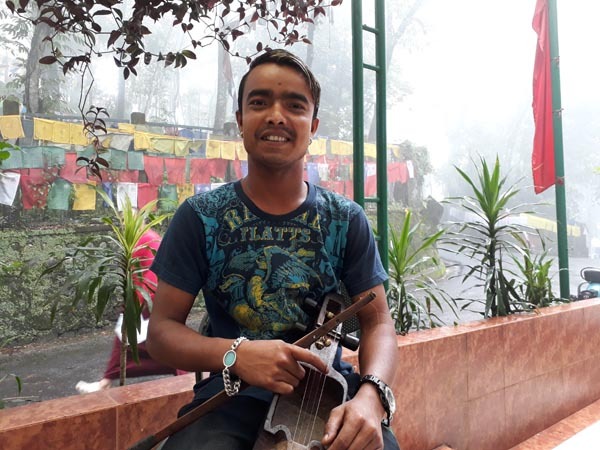 A street singer from Rangpo in East Sikkim Santosh Gandarva is on his way to meet popular music director and singer of the country, Pritam. 28-years-old Santosh left for Mumbai from Bagdogra airport on Friday to meet Pritam. He is a known face in Gangtok for performing with hisSarangi, a Nepali Folk instrument, in streets of Gangtok. It is like a big dream comes true for a Sikkimese street singer to meet the renowned music director. The tweet went viral and shared many times by the people. In the video Santosh was singing this famous bollywood number Channa Mereya from movie Ae Dil Hai Mushkil with his Sarangi in a street of Gangtok. The song was written by Amitabh Bhattacharya and composed by Pritam himself.